The Rockport Film Review: "Marina Abramovic The Artist is Present"
With over 200 reviews in the rearview, this is the first documentary to be featured in the long history of the Rockport Review. 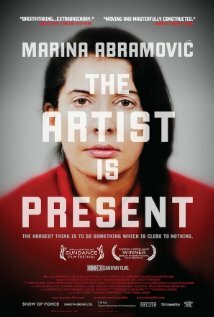 It took a doc like "Marina Abramovic The Artist is Present" to break in. It is simply an event to behold. It's simplistic, bizarre, and extremely moving. It's the world performance art. 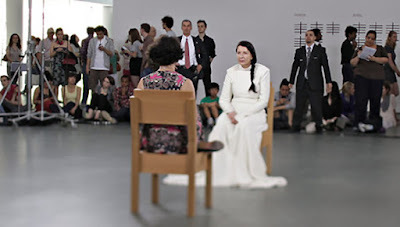 This film documents the MoMA retrospective exhibit of Marina Abramovic a controversial and boundary crushing Eastern European performance artist. Now at 63, she launches her newest performance, also the name of the exhibit, The artist is present. For the whole length of the exhibit which is 3 months, she will be sitting silently across from members of the audience in a shared experience. 6 days a week, 7 hours a day in a squared off space. Two chairs facing each other with a table between them. An electric and bizarre atmosphere envelopes the two strangers who lock eyes in a sort of staring contest for an indeterminate amount of time. It's a monumental achievement in self-discipline and how she can control her own mind and body for such long periods of time. We are also given a retrospective on her career as well with videos and interviews. She has been performing since the early 1970s and her work explores a wide range of human dynamics and the relationship between the artist and the viewer. She has performed many works with her now former lover Ulay and these are prominently featured here. Her work leaves many people asking "Why is this Art?" Ah, the question that has plagued mankind for centuries, What is art? Her massive exhibit features other performance artists recreating many of her previous works, but at the heart of it all is Marina herself in that chair staring back at you. The exhibit, which took place in 2010, looked to be quite the cultural phenomenon with people waiting for hours are even days for their chance to sit across from her. It was like she took on this Christ-like figure, as people were weeping and worshiping her. Marina's eyes gave out a sort of unconditional motherly love that drove many of the people to tears. As the exhibit wore on people got more and more desperate to see her. It also brought to light the nature of celebrity and how groups of people can be enchanted and mesmerized by a single person. I'd highly recommend taking a look at this film as it is quite the experience, it was produced by HBO and can be found on DVD.